Ocean Front Private Home with Miles of Beach to Explore! Peak Season Savings! Private home located on the Ocean in Paradise with 3 bedrooms and 2 baths. Oceanfront Paradise is located directly on the beautiful beaches of Pelican Point. A friendly, secluded fishing village on the east end of Grand Bahama Island. This is the ultimate in a serene, peaceful getaway but is close enough to Freeport to experience dining, shopping, tours, nightlife and casinos. Come and enjoy the gorgeous views, the tranquility and relax on the deck or beach overlooking the breathtaking clear waters of the ocean just feet away. Escape the madness and relax in paradise! We have an 18 foot Freeport skiff available for experienced boaters and/or licensed captains. If you're interested in the boat let us know in your initial inquiry. We rent the boat per days use. An abundance of activities are available including Bone-fishing, snorkeling, coral reef explorations and 'out island' tours. All while enjoying a private sunny home with breathtaking views, crystal clear ocean waters, vast sandy beaches and spectacular sunsets! A perfect paradise to enjoy with your family! We will help you to make this a vacation filled with great memories and a place you can return to year after year! Become part of our great list of growing guest family members! ***We can assist with transportation suggestions/boat rental possibilities and tour locations. Our 18 foot Freeport skiff may be available to qualified and experienced boaters and captains only. There is a separate rental fee and deposit for the 18 foot skiff. The open ocean and weather conditions require experience to navigate therefore this requirement is not negotiable. We will connect you with a local boating expert who provides tours and fishing if you do not hold credentials to rent our boat. If you are interested please send me a message and I'll be happy to discuss the options with you and provide you with more information. Let me help you to make this the most memorable, fun and best vacation of your life! House is Ocean Front. The back yard is the beach and ocean. Gorgeous beach and water views from the privacy of your own deck. 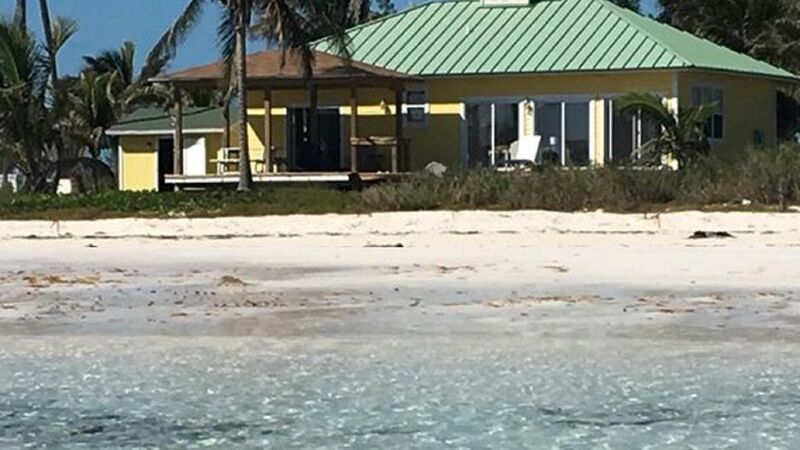 This home is located right on the beach 50 feet from the water. Views of the Ocean from the kitchen, dining area, living room, master and some side views also. Various but best to bring your own. 18 foot boat available to rent. (deposit required) We require as a condition of rental only experienced boaters and/or licensed captains. House was clean, comfortable, relaxing, etc. It is located on a beautiful beach. We enjoyed talking with the locals, snorkeling, sun bathing, and even a little island hopping via the ferry. We will definitely be returning! We appreciate you and are so pleased that you enjoyed your stay with us! It was a pleasure working with you and we look forward to you returning to Paradise @ Pelican Point again in the near future! Thank you! This is my 10th year staying at this amazing house! This year we stayed for an extended amount of time, and as always it was just perfect. The house had some upgrades, which only made it that much better! We love this part of the island; the beach was perfect! We love staying at this house - and can't wait to return. Also, working with Suzannah is a snap. She is super responsive, and extremely communicative about the house and what every guest needs. Also - bonus here is that the house is wired, and the internet was working perfectly - which made streaming on their smart TV a breeze. The property was amazing...frankly much nicer than we were expecting. It is clean and well appointed and situated in a small village that epitomizes the Bahama experience. The owners Calvin and Susan are great and the local staff, they have on call for questions, couldn't be more helpful. The beach is the perfect balance of white sand and a few small rock areas that hold great critters when the tide is out. There is unique topography on the beach with a shallow sand bar about 30 yards from shore that makes for a perfect place for kids to play. We are already making plans to return next year! the place is out of nowhere. The house was extremely dirty and not ready the house keeper were trying to to laundry you could barely see through the sliding door that could not open. The deck was is very bad shape, the dishwasher was not working, most picture on the advertisement were from the house next door, the fabulous beach is nothing but rocks in front of the house. We did not stay there even one night. The other thing is nobody mentioned that Hurricane Andrew pretty much destroy the Island....Even though the island is beautiful it looks like 3rd world country. We appreciate your feedback and we’re so sorry you were disappointed with the location. We do our very best to convey Pelican Points quaint and quiet location. We apologize that the cleaning service was still there upon your arrival. We have addressed the timing issue and have had no problems since. The sliding glass door has been replaced and the dish washer was newly installed but not yet hooked up yet which is why is wasn't listed in the amenities. The ocean, beach and overall topography are unpredictable, it is nature at its best! Unfortunately we cannot promise or guarantee that nature will cooperate for your visit. The pictures listed on this site are of our home and the beach is directly in front with miles more to explore in either direction. Hurricane Andrew was tough on everyone, but the island and its people have recovered. This is a paradise for those who wish to unplug, decompress and enjoy the beauty of a quaint little fishing village, the local small community and the incredibly gorgeous views! Todo perfecto!!! La Casa Tiene todo Lo nesesario y esta a Pasos Del mar, lugar muy tranquilo para disfrutar en familia . Es el cuarto año Que vamos a Pelicant point. Exelente para disfrutar la pesca y vida de playa en familia. Esperamos poder volver el proximo año. This vacation goes down in my record book for probably the best vacation I have ever been on. The house was beautiful, the management personnel were great and easy to deal with, the beach and waters were breathtaking, and fishing was phenomenal! I am a boat captain in Florida so I sort of know what I'm doing even though I was new to the Bahamas! We had fresh fish for dinner every night ! I would totally rent this property again! The only downside to the trip that has nothing to do with the property condition or the house is the horse flies so bring spray of there is one for them! Just some advice for anyone who goes to stay in the area but do not let it hinder you from renting this beautiful home! Thank you so much Steve, you've been fantastic! It has been our pleasure to assist you and we look forward to having you back again! Very peaceful, quiet and quaint village area. Warm, friendly neighbors with a community spirit. Wake up in the morning and drink your coffee on the deck while hearing the sounds of the ocean and looking at the breathtaking ocean and beach views. You will recharge away from the chaos of the world while wrapped in a warm ocean breeze and sunshine. Sit back relax, fish, walk the beach, explore the reefs right out of the the back door.... decompress and enjoy! Roughly 40 minutes East of Freeport on the Grand Bahama Island. A short ride to where your next memories will be made! Payment is due in full at time of booking. Any needed payment arrangement may be discussed. Send me a message I'll be happy to help.